Christine Landon first began coaching at Cobra in 2011. 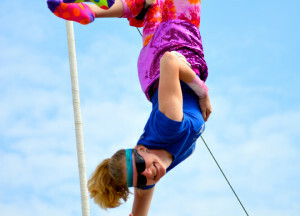 She has a background in circus arts and teaching youth skiing and snowboarding. Christine currently teaches Phys Ed at two elementary schools three days a week. Once winter arrives she will be leading the Trekker program at Pico Mountain. Christine hails from Florida where she attended Florida State University. While in college, she performed Spanish Web, Swinging Trapeze, Juggling, High Wire and more. Along with performing, Christine coached and rigged while earning a B.S. in criminology and M.S in sports administration. After graduating, she traveled around the world before settling in Vermont.